When Tian Feng is at the brink of death, he can select any character. They discard X cards or draw Y. X being the number of units of health they have and Y is the difference between their current and maximum health levels. When another character's health is reduced so that their final health level is greater than or equal to the number of cards in Tian Feng's hand, Tian Feng draws one card. Whenever another character dies, Tian Feng loses one health. When Tian Feng is at the brink of death, Tian Feng activates "Admonishing at Death's Door" before before the players are prompted to save him with a Peach. Tian Feng can select himself when activating "Admonishing at Death's Door" when he is on the brink of death. If he selects option 1, he is forced to discard zero cards (essentially making this a null option). If he selects option 2, he draws three cards, as this is the number of units of health that Tian Feng is 'missing' (or four cards if he is king in a game with five or more players. When Tian Feng activates option 1 of "Admonishing at Death's Door," the targeted player must discard Y cards, and to do so they can discard equipped and/or hand cards. Note that "Following the Trend" is enforced and Tian Feng cannot choose to not activate either part of this ability when the respective conditions are met. Please forgive the confusing wording of the first sentence of "Following the Trend." The ability is not straightforward. QSanGuoSha allows Tian Feng to draw cards when other characters suffer normal or negligence damage in such a way that their health level after the damage is greater than or equal to Tian Feng's health level. Also, if a character suffers multiple units of damage in one instance (such as an Attack with Wine), QSanGuoSha 'separates' these units of damage and awards Tian Feng one card for each unit of damage that meets the requirement. Note that Tian Feng only draws cards via "Following the Trend" when other characters are damaged. He cannot draw cards through this ability when he is damaged. "Admonishing at Death's Door" gives Tian Feng many options when he is on the brink of death. Option 1 is like Ma Su's "Bottomless Tears" while option 2 is like Bu Lian Shi's "Memory." While its effect is not usually as extreme as that of these two abilities, it can be activated each time that Tian Feng enters the brink of death. Option 2 of "Admonishing at Death's Door" can be used to target Tian Feng, allowing him to draw three cards each time he is on the brink of death. This is useful if he is desperate and looking for a Peach or Wine. 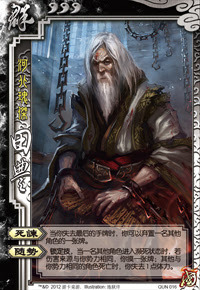 "Following the Trend" allows Tian Feng to draw cards frequently. If he has few hand cards when any character (including himself) plays Barbarians or Hail of Arrows, he could potentially draw many cards if many characters are damaged. Without knowing the top three cards of the deck, it can be sometimes be difficult to determine how to use "Admonishing at Death's Door" when Tian Feng is on the brink of death. While it is useful to look for a Peach or Wine, Tian Feng may waste the use of this ability if he chooses himself, does not find a card that can save him and dies as a result, as the three cards are discarded if he dies. In cases like this, it would have been more useful to Tian Feng's team if he helped one of his allies or forced an enemy to discard cards. "Following the Trend" is not useful if Tian Feng has many cards or if the other characters are already low on health. "Following the Trend" provides Tian Feng with a significant weakness. While it may not seem like a big deal to suffer one unit of damage each time a character dies, it is significant to Tian Feng because he has a base health of three, especially if he is low on health when the character dies. Yuan Shao/Xun You/Zhu Rong/Cao Cao - These characters can easily play Hail of Arrows and/or Barbarians. Because these cards target and potentially damage all characters, Tian Feng can possibly draw many cards when these characters use their abilities to play these cards via "Following the Trend." However, some of these characters can potentially (and inadvertently) cause Tian Feng harm if they kill other characters. Hua Tuo/Wu Guo Tai/Han Dang/Cheng Pu - These characters have abilities that allow them to easily save characters from the brink of death. This is useful in keeping Tian Feng alive as he uses "Admonishing at Death's Door." Dong Zhuo - Dong Zhuo's presence is very beneficial to Tian Feng as he starts the game with eight units of health and "Collapse" allows Dong Zhuo to reduce his health limit on a regular basis, giving Tian Feng the ability to draw more cards. Also, if Dong Zhuo keeps his maximum health limit high and Tian Feng reaches the brink of death, he can stand to draw a lot of cards via "Admonishing at Death's Door." Jia Xu - Jia Xu's "Complete Kill" prevents other characters from saving their allies on the brink of death with a Peach. This can be problematic for Tian Feng as he suffers negligence damage when another character dies. Furthermore, Jia Xu can potentially 'kill two birds with one stone' by killing one of Tian Feng's allies, then causing Tian Feng to die in the process from "Following the Trend." King Tian Feng is a fairly good king choice. He greatly benefits from the extra unit of health when he uses "Admonishing at Death's Door." However, at the start of the game, it is sometimes difficult for him to rid himself of extra hand cards, making it more difficult to draw cards via "Following the Trend." Loyalist Tian Feng is a good loyalist pick, especially if Dong Zhuo or Yuan Shao are the kings. His abilities allow him to draw cards frequently and he can help the king each time he enters the brink of death. Rebel Tian Feng is a good rebel. Because the king has an additional unit of health in a game of five or more players, Tian Feng has a greater chance of drawing cards when he/she is damaged. Also, with a three-card bounty on his head, he will often be brought to the brink of death, making "Admonishing at Death's Door" more powerful. Spy Tian Feng is a very weak spy. He needs a team in order to be effective. Also, as the spy, he will not be a high-profile target. While this is usually a good thing, Tian Feng needs to be brought to the brink of death to use "Admonishing at Death's Door," and he needs to be saved in order to maximized its usefulness. Because he is not a member of either team, none of the other characters will be particularly eager to kill or save him. Additionally, "Following the Trend" will ensure that he will take several units of damage before completing his objective as the spy, as all other characters need to die before Tian Feng finishes the king. In an eight-person game, this means that TIan Feng would have to take six (!) units of damage as the six rebels/loyalists die before his one-on-one battle with the king. Although he is an interesting character, steer clear of him if you are the spy. Tian Feng seems to be the most interesting character of this 'Kingdom Wars Expansion.' The creators of QSanGuoSha designed this Tian Feng to significantly differ from the official Kingdom Wars version. On one hand, it is disappointing to not be able to experience Tian Feng as YOKA intended for him to be used, but on the other hand, the creators of this game made a very interesting character to use. When using him, use the same mindset that you would if you were using Xun Yu or Lu Xun - get rid of as many hand cards as possible, then try to inflict as much damage as possible with Attacks, Barbarians, or Hail of Arrows. Also, try to hold on to Wines and Peaches instead of using them during your turn so you can ensure that you survive the brink of death while using "Admonishing at Death's Door."